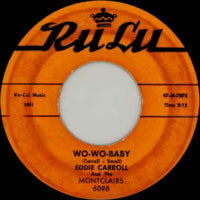 Chanteur Rock 'n' Roll US, Eddie Carroll a enregistré chez Ru Lu, Guyden, Santo, Pure Gold et Fernwood Records. 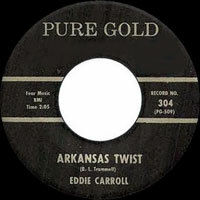 Although sometimes mistaken for the Eddie Carroll who played piano in British jazz bands and another Eddie Carroll who appears on television situation comedies as well as working the voice of Jiminy Cricket, the rockabilly cat Eddie Carroll was his own man. 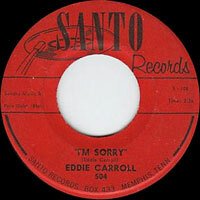 He could have used the talents of these other guys named Eddie Carroll to extend his own, but did quite well nonetheless on a series of independent singles released between 1962 and 1964. Some of this material came out through the auspices of Fernwood, a slightly demented rockabilly and early rock and roll label run out of Memphis, Tennessee between 1957 and 1965 by Ronald "Slim" Wallace. Fernwood was important in the early careers of performers such as country and western saxophonist Ace Cannon, and also promoted some somewhat strange bands such as The Mice. Wallace picked up some even tinier labels such as @Santo and Pure Gold for distribution, which is where he got his hands on the Carroll material. 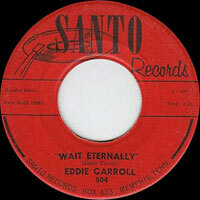 "Wait Eternally" could have been Carroll's description of his own state of mind as he awaited his very first recording break in 1962, but the flip side "I'm Sorry" sounds more like the producer's reaction at hearing this somewhat weak set of tracks. The following year's "Arkansas Twist" was somewhat better, providing geographical references for rockabilly scholars attempting to locate vintage performers. 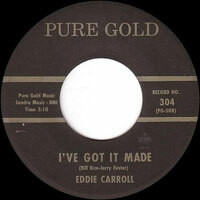 The flip side of "I've Got It Made" was presumptous in terms of Carroll's career, however. He waited more than a year again before the Fernwood honcho let him record the "Golden Door Night Club", one of the classic "nightclub" songs in the rockabilly genre. The song was matched with the maudlin "I've Never Met An Angel Before", an admission that goes without saying amongst this crowd. Much of the Carroll material is available on a Stompertime collection of Fernwood tracks aptly entitled Fernwood Rock and Roll.